Real teens are making a difference in the lives of others and the entire world by getting involved with current events. Join your "do something" generation and read news articles for teenagers about what's happening right now around the world to get started. The most common source for current events may still be traditional sources such as newspapers and news networks. Many adult magazines and newspapers have websites dedicated to teen current events such as Smithsonian Teen Tribune and HuffPost Teen. 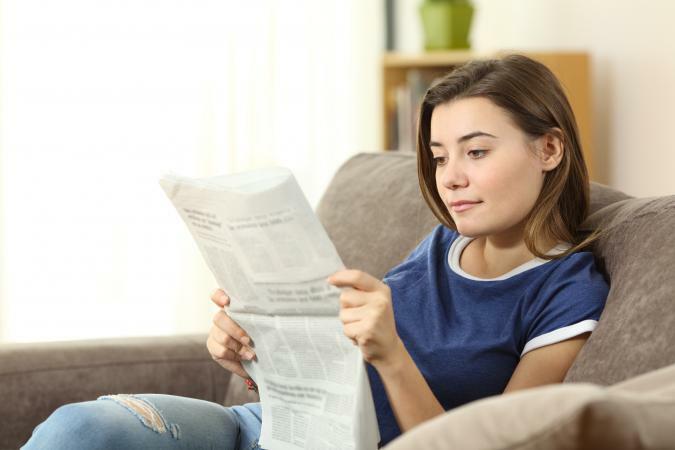 Most teen news websites offer current events on topics such as happenings in the area, local band news, what's going on with celebrities, and what's happening around the world. Scholastic and The New York Times teamed up to present Upfront magazine for teens in Grades 9 to 12. The magazine supports ELA and Social Studies standards so it mostly covers only current events related to those subjects. Teachers can purchase subscriptions to the magazine for their classroom with a minimum order of 10 subscriptions. You get 7 issues for $6 with each student subscription. New York Times Learning Network offers current events for teens on a huge variety of topics in an RSS feed format that is updated regularly. All the articles and resources on The Learning Network web pages relate back to New York Times articles and are geared toward students. Everything for students is free including information on a variety of topics from fashion to science and pop culture to foreign affairs. Other great student features include article discussion questions, writing prompts, quizzes, and contests. Made just for students and teachers in Grades 7 through 12, PBS News Hour Extra aims to help teens understand current events. You can read through the daily featured articles or search by category from Arts & Culture to Geography and Politics to Science. The "Student Voices" section features answers from teens around the world to probing and timely questions related to current events. If you like to watch news shows for teens, Teen Kids News is a great half-hour option. Each episode focuses on amazing kids around the world and how they are making a difference. All the reporters are kids and you can watch episodes on their website or look at their airing schedule to see when shows air in your area. Topics covered include business, sports, entertainment, and movies. The website is loaded with current events articles that feature pictures and videos to help illustrate the news. Student News Daily is a current events news site made explicitly for high school students. Most of the content is related to world news and politics, but there are occasionally other types of stories too. Each article features discussion questions at the end and you can subscribe for free to receive the answers to all the questions. Current events apps bring the latest news to you instantly so you can always be in the know. You can typically download these types of apps for free and even get mobile alerts with breaking news. Rated "T" for "Teen," the free E! News app gives you up-to-the-minute news on all things related to celebrities and entertainment. Headlines, photos, videos, and behind-the-scenes extras are all par for the course with this app. Although it's rated for ages 17 and up, the Reddit App is great for teens who want to keep up with what's trending on the internet. The app is free and you can even subscribe to your favorite subreddits to keep the content personalized to your interests. Reddit is all about getting your voice heard on topics ranging from news and sports to viral videos and hot memes. YouTube is full of channels and videos created by all kinds of people about all kinds of things. It's also one of the top apps used by teens because of the high entertainment value, even when watching videos about current events. The trick to finding a great current events channel to subscribe to is checking out what's trending and ensuring the creator features real, timely information. Trusted sources like the NFL channel give you sports highlights and extras while YouTubers such as Kalen Allen, who now has his own section on The Ellen Show's YouTube channel, offer fun commentary on current events. While you can still listen to news radio shows, current events podcasts are more fitting for the teenage lifestyle. You can listen to informative podcasts while walking to school, relaxing at home, or even doing your chores. Youth Radio presents Adult Ish, a podcast made by young people for young people about all things from hip-hop to politics. Episodes are 40 to 50 minutes long and feature a variety of special guest comedians, actors, and musicians. The hosts of the show are in their early 20s and some content is on the adult side, but it definitely covers timely topics. This daily five-minute podcast explores what's happening right now in the world of technology. On each episode of TechStuff Daily, you can learn about issues related to advancing technology and why it's important to understand. Since teens are living in a technology world, these current events discussions relate directly to their everyday lives and their futures. Listen to other teens discuss current events that impact teenage life on the weekly radio show, 411 Teen. You can listen to episodes when they air on the radio or listen to archived episodes online. Each episode is about an hour long and focuses on a different topic that relates to typical teenage struggles and current events or discussions happening in the real world. Understanding current events and staying up to date on world news helps you better understand the world you live in. Reading articles and listening to news stories aimed at your age group can motivate you to take up a cause, give you the knowledge to have meaningful conversations with other teens and adults, and enhance your relationship with mass media.